Good seeds are undoubtedly one of the most important materials for farmers. The seeds must be healthy and, preferably, they must possess all the desirable properties that farmers need such as high yielding, high quality, and resistances to diseases, insect pests and envi-ronmental stresses. 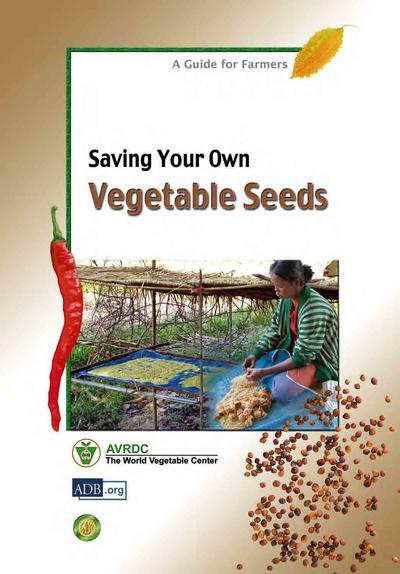 The Asian Regional Center of AVRDC (AVRDC-ARC) has been conducting training on vegetable production technologies including seed production, seed testing and seed preser-vation at the regional training center in Kamphaeng Saen, Thailand in collaboration with Kasetsart University for 24 years. The number of trainees who have participated from Cam-bodia, Lao PDR, Vietnam and Myanmar numbered 205 by the year 2004. The regional training was conducted mainly for extension workers and researchers, and it has contributed to increasing the numbers of trainers in these countries. After going back to their own coun-tries, the graduates of this training program have become resource persons. They engaged in in-country training on vegetable production. Various kinds of in-country training have been conducted in relation to vegetable produc-tion. As an off-shoot, the production of vegetable seeds is now being conducted in these countries. However, it seems that the technologies for seed production have not yet reached down to the level of ordinary farmers adequately. Many farmers still need to learn the tech-niques required to produce vegetable seeds by themselves. Seed production of vegetables is not as simple as it is for many self-pollinated staple crops, including beans and some cereal grains. Specific techniques are required for every type of vegetable. Aside from this, F1 hybrid vegetable seeds are now prevailing in the market, and farmers must be informed that the seeds obtained from the harvest of these crops cannot be used for sowing future crops. Therefore, the dissemination of seed production technologies based on reliable information is needed. The manual provided here was written by the teachers of Kasetsart University and AVRDC headquarters who have been working together with AVRDC-ARC. This edi-tion is made in an effort to help extension workers who are directly in contact with farmers. I am hoping that this manual will help ordinary farmers and will contribute to the sustain-able development of agriculture through vegetable production in developing countries.